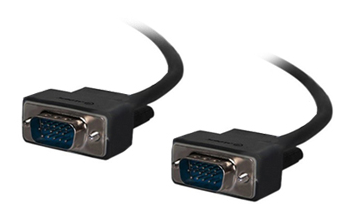 The ALOGIC VGA/SVGA Premium Shielded Monitor Cable W/ Filter Male to Male Cable is perfect for source to display connectivity for inhome desktop or inwall commercial applications which require video resolutions of up to 1920 X 1200.The ALOGIC cable is foiled and braided shielded to reduce interference and noise. All the 15 pins are wired providing support for DDC2 (EDDC) and Extended Display Identification Data (EDID) signals i.e. communication of the displays capabilities ensuring that the content from the source is sent at the optimal resolution for the display.The lowprofile connectors make installing in tight spaces an easy job.